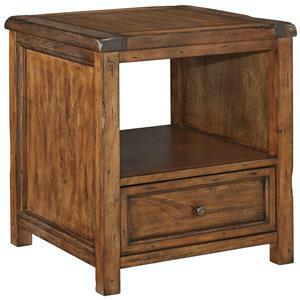 Made with mango veneers and select hardwood solids in a medium rustic finish, this c-table style chair side end table offers a thick bread board like top with solid wood edges and chisel gouged details for distressed character. The unique shape can be conveniently pulled right up to your seat. 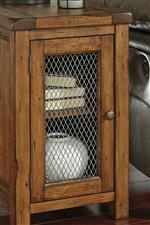 Diamond pattern wire mesh adds a hint of industrial style to the door and offers a view through to your books or magazines on the built-in rack. 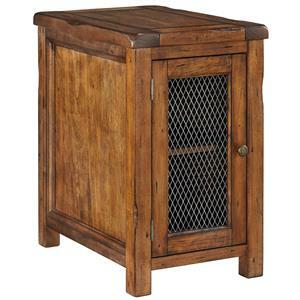 Magazine holder 11.00" x 2.25" x 16.38"
Bottom opening 11.00" x 2.63" x 2.25"
The Tamonie Rustic C-Shape Chair Side End Table with Wire Mesh by Signature Design by Ashley at Value City Furniture in the New Jersey, NJ, Staten Island, Hoboken area. Product availability may vary. Contact us for the most current availability on this product. 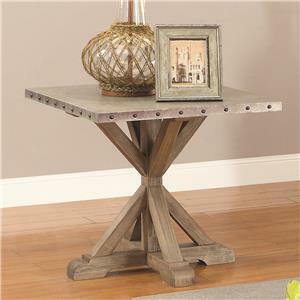 Rustic mango veneers in a medium brown finish over vintage casual design style to this accent table collection. 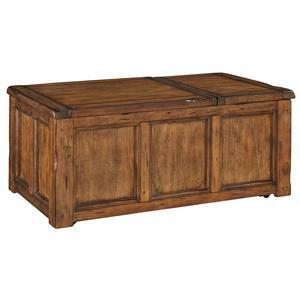 Each piece has its own charm and functionality for your living and entertaining space. 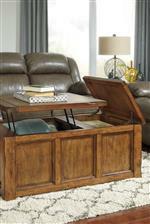 The trunk style cocktail table offers a lift top, concealed storage and casters at its base. 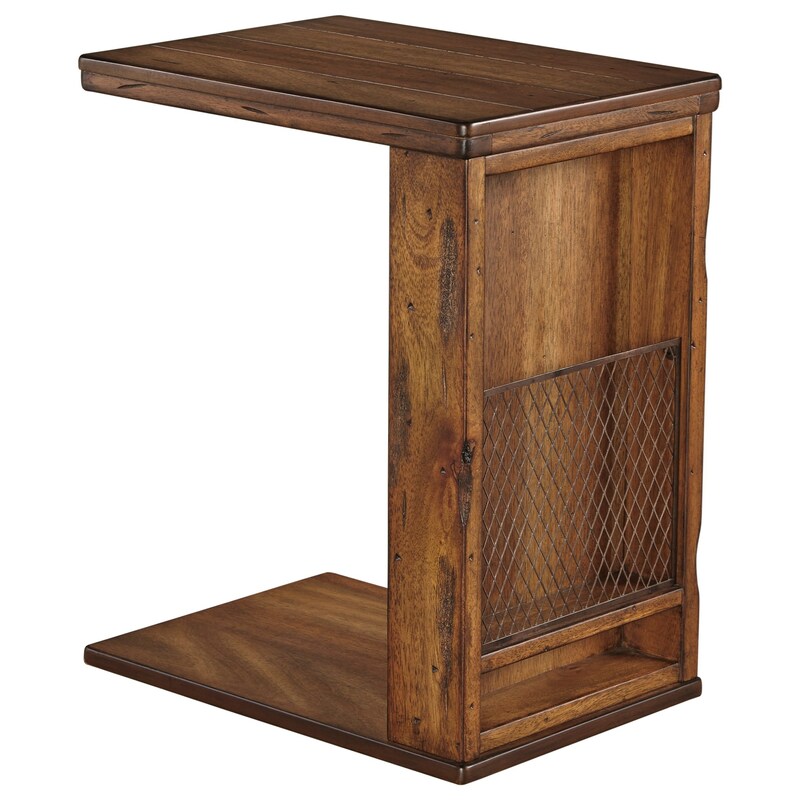 Additional items available include the square end table with an open shelf and drawer as well as a chair side table with a wire mesh door with shelving inside. The Tamonie collection is a great option if you are looking for Relaxed Vintage Casual furniture in the New Jersey, NJ, Staten Island, Hoboken area. 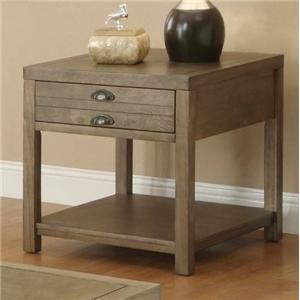 Browse other items in the Tamonie collection from Value City Furniture in the New Jersey, NJ, Staten Island, Hoboken area.